With about twelve inches of snow on the ground my husband and I decided to hike up Mt. Tekoa. We took turns breaking trail as it was exhausting going. If we didn’t make it to the top we agreed that was okay, but we’d trudge along as far as we could. When we hit the ridge, snowmobilers had packed the snow and it was much easier going, so we made it to a vantage point. After pictures and lunch with a view, we headed back down. Following our trail back down we made a most curious observation. Every one of our previous foot depressions was peppered with little black springtails, Hypogastrura nivicola. 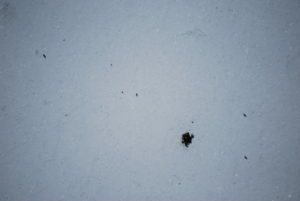 These tiny creatures, sometimes referred to as snowfleas, are not fleas at all; nor are they even insects. They are another type of arthropod classified as a hexapod. They must have something in multiples of six I suppose. 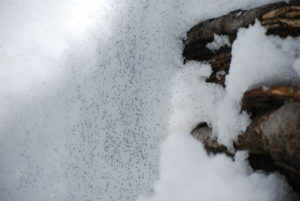 But these tiny creatures, now clearly visible against the snow, are abundant year-round. They usually live in the leaf litter eating fungus, algae and decaying leaves while being quite invisible. Some scientists postulate that overcrowded conditions down below force some to migrate up through the snow, but it remains a mystery as to exactly why they collect on top of the snow like this. We spend considerable time on our knees crouched over observing these weird creatures hurling themselves about. Under their abdomen is a spring, called a furculum, which can catapult them 100 times their body length in distance. It’s fascinating to watch little dots randomly appearing and disappearing by the hundreds in every footprint. Next winter walk you take in the woods, get your pants snowy and kneel down to examine this “snow pepper.” Come up with your own ideas as to why springtails burrow up through the snow to hurl themselves about in plain sight.